Although we refer to artichokes as to vegetables, they are actually the flower buds of the plant. They are so delicious that deserve their own holiday. By the way, March 16 is National Artichoke Hearts Day. The first mention of artichokes was found in a book on the medicinal uses of plants. The book dates around 40-70 AD, so it gives us a hint, that artichokes has been known for ages. Artichokes are believed to originate in the Mediterranean region and are the part of sunflower family. 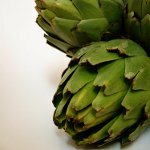 Food historians do not know when artichokes became the part of our diet, but we know that Spanish settlers cultivated them in California during the 1600s. However, artichokes didn't gain popularity in America until early 1900s. Did you know, that artichokes were outlawed for a week in New York? This happened in 1920s, when officials decided to try to curb mafia-driven price gouging. Today artichokes are totally legal, so why don't you try a new recipe with them to make a dinner and celebrate National Artichoke Hearts Day?